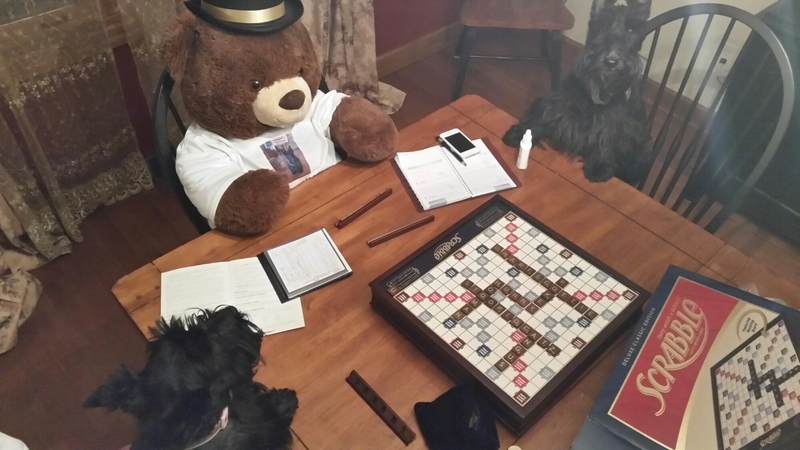 Me, Ainsley, and Mr Bear played scottie scrabble last night. As you can see, I won of course. All the words on the board are mine. Ainsley didn’t get a single point, and Mr Bear, though he got on the board first, has quite the limited vocabulary and only scored one word. They say this game is hard. I didn’t find in very hard. I had no trouble at all using my “Z” as you can tell. Perhaps next time I need a more worthy adversary. Maybe Uncle Bob or Mama next time? Definitely Uncle Bob and Mama would be formidable opponents for sure. How come every word on the board is “woof”? Ya did pretty good – but ya missed some obvious words like arooo, woof, and bark. So I gather that you quit quietly. Angus I think you are playing with fire if you want to take on Mama or Uncle Bob. What if you first start with Catman and Aunt Judy first. Are they not a better bet first? BOL! I knew that must be you, Buddy!